Personally my favorite aspect of drawing up the weekly small school rankings is giving a small bit of extra attention to programs and players who normally don’t get any recognition. There are literally a half dozen polls covering the highest level at D-I, but D-II, the NAIA and D-III are often distant afterthoughts (or not acknowledged at all). Along with the updated Top 25 this week are a handful of capsules on players playing for schools that aren’t currently in the rankings. It’s an opportunity to help expand the spotlight a little more and showcase them for their spectacular statistical performances so far this season. If they continue their torrid paces it’s quite possible that they’ll help propel their clubs into the national rankings sooner than later. Rankings are based on games through Sunday, March 17. The Eagles’ Tyler Thompson impressed as freshman, batting .301 with a couple of home runs and double-digit stolen bases, but those numbers are puny compared to the ridonculousoutput he has generated this spring. In 80 at-bats he has managed to safely get a hit 35 times and reach 24 times via a walk or HBP. The numbers put him at a .438 batting average with an eye-popping .562 on-base percentage. He has also developed some extra oomph in his swing and has 10 doubles, a pair of triples and four home runs. It is that production which has helped propel Carson-Newman on the outskirts of the Perfect Game rankings as they currently have an 18-10 record. Thompson has had multiple hit games 13 times this season, the most recent of which was against Catawba and their 7-0 ace Bryan Ketchie. Despite his immediate success on the college diamond, baseball wasn’t his first love when it came to sports. Thompson excelled at and adored football in high school, however, a number of injuries the length of a CVS receipt changed his sporting perspective. He has had multiple concussions, a torn medial collateral ligament and a stress fracture in his back. Additionally an impact with a defender also forced him to get facial reconstruction surgery. Junior second baseman Daulton Martin has been a proficient presence since the day he arrived on campus. As a freshman he batted .372 and upped his average to .413 as a sophomore, which led the South Atlantic Conference. The 86 hits he tallied last season put in the top 10 in the Tusculum record book and he reached base safely in 51 of 52 games. This season his offensive outburst has continued. He is topping the team with a .394 average and already has 17 doubles and six home runs for a staggering .779 slugging percentage. Tusculum head baseball coach Brandon Steele has nothing but praise for Martin. “Daulton had been a catalyst of offense since he arrived on campus as a freshman,” Steele stated. “He continues to grow and develop as a hitter and works tirelessly at it. I expect him to continue to be a run producer for us and be a leader on the field for us. Martin isn’t the only big-time producer which has the Pioneers record at 18-10 and on the cusp of national rankings contention. 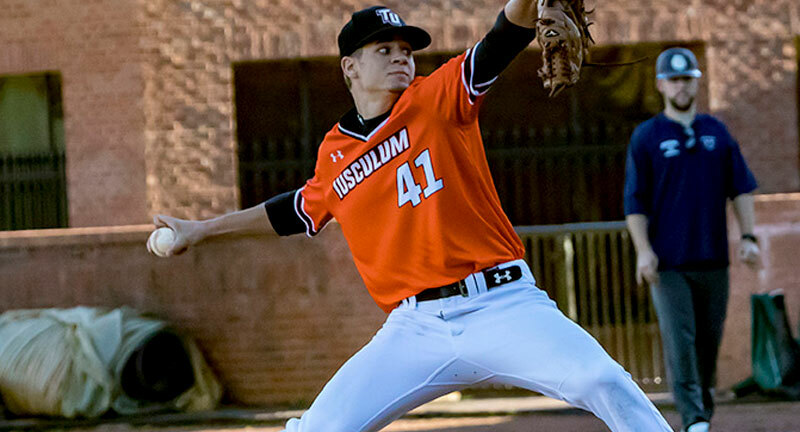 Tusculum has an impressive presence on the mound as well in Charles Hall. Hall has made seven starts this season and totaled 45 2/3 innings. During the time on the mound he has earned a 1.58 ERA, only allowed 30 hits and astonishingly has struck out 88 batters. That strikeout mark has already eclipsed the total he had last season when he fanned 71 in 73 1/3 innings. Last season he finished with a 4.42 ERA and 4-3 in a mixed role. For his numbers he was named to the All-SAC Second Team. With the numbers he’d compiling so far he is on the short-short list for pitcher of the year consideration. Furthermore, if he continues to impress and develop he could have his name called in this year’s MLB amateur draft. With an 18-6 team record the Missouri Southern Lions have garnered consideration for the Perfect Game Top 25 but are still on the outside looking in for now. Their exclusion may not last much longer due to their top two pitchers of Will Bausinger and Zach Parish. Together the tandem has combined to earn an 8-1 record and totaled 83 innings on the mound. During that time they’ve only allowed 50 hits and 24 walks with 120 strikeouts. Their breakout success has been a surprise as neither of them put up astonishing numbers in the ballpark of this season’s success. Last season Bausinger had a 5.40 ERA and allowed 49 hits and 29 walks in 45 innings. Parish previously pitched at Northeastern State in 2017 where he had a 4-4 record with a 5.14 ERA. Last weekend Parish threw six scoreless innings against Ft Hays State in which he stuck out 15 batters. Bausinger also earned a win in the series, starting the final game that gave the Lions the sweep. In that game he threw six and struck out seven while allowing only two runs to score. MSSU Coach Bryce Darnell has poured praise on the pair. In a conference with the ilk of perennial powers Tampa, Florida Southern and Nova Southeastern, it can be difficult for a pitcher to put up prolific numbers against such high-caliber competition, yet Dillon McCollough has been an absolute ace for Eckerd. He was a weekend starter as a freshman and an All-SSC performer as a sophomore. Last season he once struck out 16 during 9 2/3 shutout innings and on another occasion threw a complete game one-hitter. He led the Tritons in wins, complete games, ERA, strikeouts and opposing batting average. Head coach Josh Beauregard speaks highly of his ace. This season McCollough has raised his game to yet another level. In his eight appearances so far, he has earned a 5-0 record and 1.70 ERA. In 53 innings he has held opposition to a .219 batting average and stuck out 70 batters while only allowing 10 walks. This past weekend he held Florida Southern at bay, throwing 6 1/3 innings with nine strikeouts and only three earned runs to get the win. Dropped out: Minnesota State (18), Florida Southern (25). Tararez is a sturdy 6-foot-5 senior pitcher from the Dominican Republic who has been freaky phenomenal this season. After throwing eight innings in a win over Grand View on Saturday, in which he only allowed a single hit with 16 strikeouts, he lowered his eye-popping numbers to rank fourth in the NAIA in opposing batting average at a teensy .136 mark. In five starts this season he has thrown a total of 26 2/3 innings while stubbornly only allowing a dozen hits. Meanwhile he has amazingly struck out 51 batters, thusly making it four times more likely that a batter would strike out against him rather than get a hit. He has already earned the Heart of America Pitcher of the Week title once this season, earning the honor after throwing a complete game two hitter with 14 strikeouts over Graceland earlier in the month. He most certainly receive the award again this week after setting his new career high in Ks. Tavarez was just as dominating last season earning an 8-3 record for the Bobcats as he was first in the Heart Conference in opponent batting average (.166) and second in ERA at 2.17. Prior to Peru State, Tavarez pitched at Morton College in Cicero, Illinois. In 2017 he appeared in 16 games and impressively struck out 27 batters in 20 1/3 innings but had a robust 9.30 ERA for the Panthers. This season Shumaker is ranked ninth in the NAIA in batting as went 8-for-13 over the past weekend to raise his average to .481. He is also in the top 10 in hits per game (1.7) and total bases per game (2.8). In 77 at-bats so far this season he has 37 hits, 14 of which have gone for extra bases as he has nine doubles, a triple and four home runs. Shumaker’s batting average has practically risen exponentially since he arrived in Paducah three years ago. As a sophomore he finished the year with a solid .318 average and earned gold glove honors. As a junior he was given All-Appalachian Athletic Conference Second Team honors as he led the Bulldogs with a .424 batting average and 64 hits. Prior to attending Union, Shumaker was a starter at Shawnee Community College where he batted .321 as a freshman. The Mustangs’ slugger Trae Bobo has had a long and well-traveled college career. As a freshman he held down third base for Oklahoma Wesleyan as he helped the Eagles reach the quarterfinals of the NAIA World Series, batting .261 with five home runs. The next season he transferred down the road to D-II school Rogers State to be closer to home. There he batted .310 with six home runs for the Railcats. Unfortunately he admittedly let his grades slip and lost his scholarship, however, he didn’t lose his desire to be a part of the game. BoBo was volunteer coaching at a high school in Jonesboro when he ran into someone who had been an umpire of his back in high school (where he led his team to an Oklahoma state championship and No. 2 ranking in the nation). He asked him if he’d be interested in playing on a summer wood bat league in Kansas and Trae obliged. The CBC coaches got wind BoBo was interested in heading back to school and invited him to a workout – they offered him a roster spot that day. After returning to baseball last season BoBo made an immediate impact for the Mustangs. He played in 57 games and finished with a .282 average, eight home runs and 50 RBI. This season BoBo has erupted and has already hit 11 home runs in just 91 at-bats, which puts him in the top 10 nationally. He also is in the top 20 in total bases with 67 and is currently 28th in the county with a .736 slugging percentage. This past weekend, along with adding to his home run total with a blast against Harris-Stowe State, he was 5-for-10 with a pair of doubles and four walks. The Statesmen’s Chase Stratton has been putting up prolific numbers this season, excelling each time he takes the mound. In his six pitching starts this spring he had thrown a total of 35 2/3 innings and only allowed 20 hits (only 5.05 per nine innings and a .163 opposing batting average) with 56 strikeouts. In his latest outing of the weekend he threw six innings and only allowed a single earned run to lower his ERA to a 1.77 mark, which places him in the top 30 nationally. Earlier this year he was the Heart of America Pitcher of the Week after throwing a complete game two-hitter as he only allowed a single Evangel runner to reach second base and struck out at least one batter per inning. Last season Brueggemeyer primarily pitched for the Yellow Jackets, earning a rather robust 5.46 ERA and 4-5 record. He did have a handful of plate appearances, but only tallied a single hit in six at-bats. All in all, it wasn’t the greatest season between the lines. This year, however, Brueggemeyer has become one of the sluggiest sluggers in all of D-III. In 69 at-bats this spring as a full-time outfielder Brueggemeyer has 26 hits for a .377 batting average. Those hits include four doubles and a D-III leading six home runs and 21 RBI as he is leading LeTourneau to one of their best starts in recent history. The Boxers’ Casey Brown was solid last season, finishing the year with a 3.82 ERA in 70 2/3 innings on the mound. This season, Brown is devouring opposition like he does the Red Baron® Thin & Crispy BBQ style chicken pizza he so much desires. He has a perfect 4-0 record in his seven starts with four complete games in his last five starts. In 55 1/3 innings he has only allowed 41 hits and issued a scant seven walks while striking out 57 batters. In Brown’s last outing against Witman he went the entire game and only allowed five hits and a single earned run, which lowered his season mark to 1.95. Brown’s emergence is one of the primary reasons the Boxers are off to one of their best starts in years and currently top all Northwest Conference teams in total wins with a 15-6 record. They also lead the NWC with a 3.73 ERA – a mark a half run lower than any other club in the conference. Despite only playing only nine games this season Plymouth State center fielder Jimmy Zimolka and shortstop Joe Routhier have combined to steal 34 bases. Zimolka has had at least one stolen base in every game and Routhier amazingly swiped six bags in the season opener against Nichols. The tandem is also batting especially well, hitting .344 and .444, respectively. Their sudden base-stealing prowess is a surprising turn of events as neither were particularly stealthy on the basepaths last season. In 56 games last season they only combined for 24 stolen bases. Stevenson’s James Wiercinski has the highest strikeout per nine innings ratio of any pitcher who has thrown at least 25 innings. During his 27 innings on the mound he has amazingly struck out 48 to the tune of 16 per nine innings. The rest of his numbers are pretty impressive as well. He has only allowed 16 hits and has a 3.00 ERA on the season. He has always had a high strikeout ratio, fanning 167 over 172 1/3 innings his first three seasons, but he is breaking the bell curve this year. Dropped out: Keystone (16), Willamette (20), Spalding (23), West New England (24).